No. of Discs 26 nos. 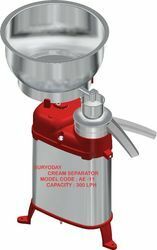 We are the leading manufacturers and suppliers of high grade Electric Milk Cream Separator (AE - 11) 300 LPH . 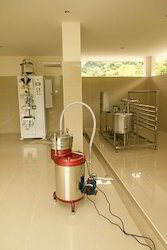 This machine is widely used for domestic and small scale industries to separate cream from skimmed milk. The tank capacity of this machine is 25 liters; production capacity is 300 liter per hour and is also available with 26 discs. Various parts of this machine is separation bowl, spout set and milk tank that is made up of stainless steel. The highly talented team of our company presents Milk Cream Separator Machine of fine quality. It is electricity driven and is presented at the industry leading rates. This machine is capable to separate 1000 liter of milk and cream in an hour and is provided with 45 discs. Our company provides this machine with SS bowl, SS disc, stainless steel body and a separator. In addition to this, it is highly appreciated for its durability, corrosion resistance and long service life. The highly talented team of our company presents Cream Separator Machine of fine quality. It is electricity driven and is presented at the industry leading rates. This machine is capable to separate 1000 liter of milk and cream in an hour and is provided with 45 discs. Our company provides this machine with SS bowl, SS disc, stainless steel body and aseparator. In addition to this, it is highly appreciated for its durability, corrosion resistance and long service life. We are the leading manufacturers and suppliers of high grade Cream Separators to our esteemed clients. 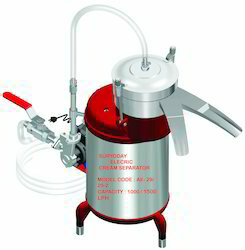 This machine is operated manually and is available with a tank of 10 liter capacity that is capable to separate cream from 60 liter of milk per hour. It is manufactured using high gradestainless steel that is sourced from known and trusted dealers. Additionally, it is suitable for domestic and commercial purpose and is available at the affordable rates. ALL the milk contacting part made from SS-304 Like spout set, separation bowl and milk tank. Very useful for domestic purpose. 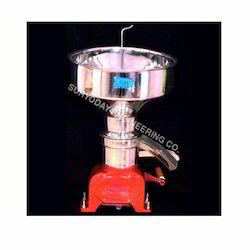 Looking for Cream Separator Machine ?